I was tidying up my stockpiled notes and folders and found an article titled “PERFUME TO MATCH GIRLS BY… FREDERIC MALLE” by Kathleen Baird-Murray. I had no recollection of printing this article… Obviously I did so while I was in my usual scatterbrain mode and put it away to read later. The later came after several months. Having read the article, it got me into the mood for filling out the Frederic Malle’s “Find Your Signature” questionnaire. Like many perfumistas, I love quite a few perfumes by FM and own a couple; it would be interesting to find out which one they think would fit for me. I got on to my laptop, went to the Editions De Parfums website and answered all the questions HONESTLY. A few days later, I received an email with the names of three fragrances. I must admit, I’m a floral girl. I love big white florals. So, naturally, I love Carnal Flower almost unconditionally. But out of these three choices, I would rather go for Portrait of A Lady. 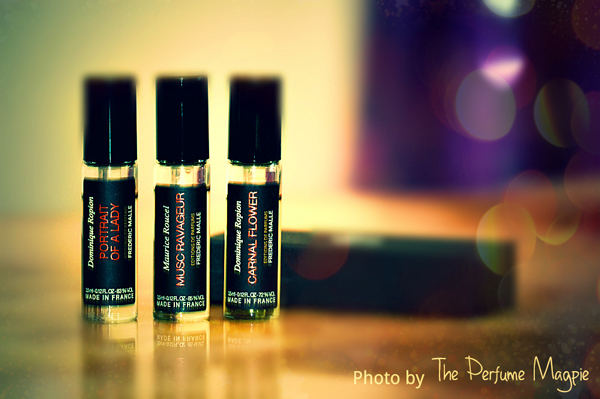 As it happens, Portrait of A Lady is already one of my “must have it around” fragrances. I can’t imagine running it out. Would I call it my signature scent though? Not really. In fact, as I get deeper and deeper into the abyss of fragrances, I’m moving further and further away from the concept of the signature scent. When I was younger, I always wanted to have a signature scent. There was a time when I truthfully stuck to only one fragrance day after day. If I remember it correctly, it lasted only for a few months. I got so sick of smelling the same perfume every single day and eventually it got to the point where I didn’t want to smell it anymore. I had realised that having only one perfume would bore the heck out of me. I love trying new perfumes; it’s endlessly fascinating. Moreover, I love choosing fragrances depending on the moods, seasons, occasions and what I wear – there are all sorts of reasons to wear a different one. I am a sort of person who values variations and changes in life. There are so many articles about helping you find your signature scent and, naturally, so many perfume houses encourage you to choose one of theirs as your holy grail. Do any of you have a signature scent? If you don’t have one yet, would you like to have one?? For many years I had what you call a signature scent: not because I thought that was how it was supposed to be but because it was the only perfume that I felt was worthy. I frankly couldn’t understand how anybody could not like it or like anything else! Of course, I was little (it started when I was 4? 5?) and then I was inexperienced. And lived in a special country. Climat by Lancôme was my first perfume love, I still love it and, had I been forced to choose just one perfume to use for the rest of my life, I would have chosen this one. But I’m glad I don’t have to 🙂 because – even before I knew what perfumista was – I was changing my perfume almost every day (out of 10-15 I had at the moment). And nowadays I rarely wear the same perfume twice during the same month. My two favorites from FM’s collection – Portrait of a Lady and Iris Poudre. PoaL would be among, let’s say’, 10 contenders for my signature scent – again, if I absolutely had to chose. Hi Undina.I’ve been aware of your love towards Portrait of A Lady; actually, because of you, I decided to try it in the first place and I fell in love with it. 🙂 I love Climat as well and even though I don’t own it now, I used to wear it in my 20s… It’s so fascinating to get to know how each perfumista got into perfumes to begin with. I think I went trough a fase of thinking a signature was what one had- but as with you I found it bored me, and I needed something else for other seasons/ occations. Funny, I always discarded both PoaL and Carnal Flower as not being for me, so have no recollection of actually trying them; something to do with tuberose and rose 😉 but I do love Musc Ravageur. Another one from the line that I love, is Parfum de Therese. It was one of those that takes time; at first I just thought it was the weirdest thing I’d ever smelled (after secretion magnifique), and then slowly it became a real favourite. In a way I always think of Parfum de Therese, when someone write PoaL, because I don’t know a perfume which is more a Lady that this one. Yuki, no Holy Grail for me, though lots of scents came close – Meteorites, Jolie Madame, Iris de Nuit, Aromatics Elixir, Le Baiser du Dragon, Paprika Brasil…You are aware of my love for violets, but my taste evolved quickly through the last…hmmm…seven-eight (!!!) years and now I am into a lot more notes and combinations, than I could ever imagine. Patchouli, iris, roses, incense, leather, vetiver.. There are certain perfumes I can’t tolerate physically, but otherwise I am eager to try as many as possible. I have insatiable fragrance hunger! I just hope that the curiosity doesn’t kill the cat in the end! Hi Lyubov, nice to see you here! Le Baiser du Dragon is one of those perfumes I’ve been meaning to try and never have. That’s another one to put on my must-try list. Meteorites is one of my love as well; it’s a gorgeous violet scent. Like you, as I get into perfumes deeper and deeper, I do get to appreciate the combinations that I had never imagined existed, even the weird ones. Portrait of a Lady is a most beautiful perfume, though it’s one of the few perfumes that I would prefer to dab rather than spray, as I find it has a very potent sillage, and for that reason, I would weary of it as a signature scent. But of course, I am like you and our other friends who have commented here: I once believed in having a signature scent (because that is the way most of the women in my world wore perfume … they were more or less monogamous to a fragrance, or maybe like my mom they had two or three perfumes that they rotated among, but it wasn’t much more than that), but as soon as I stumbled on the perfume blogs, I wanted to try everything I read about. Now, however, I’ve been following the blogs long enough that my craving to try everything has ended, but still I’m not ready to settle down to a signature scent. No, couldn’t do it. 🙂 Fun thinking about it, though, Magpie. I’ve also been through the phase of wanting to try everything I came across. Fortunately it didn’t last too long. Otherwise, I would have been completely penniless by now. I still think about it from time to time though; if I were forced to pick only one perfume for life, what would it be…? Interesting that you should raise this point, as I have just fallen for No 5 again after an interval of 30 years since I last wore it. I have been reaching for it most days lately – then in the week prior to that I wore Bois des Iles for four days – do you see an aldehydic, Chanelly kind of pattern forming? Anyway, the other night I came close to thinking that maybe I could just wear No 5 and that’s it. Then chided myself for being so silly. Today I am wearing L’Ambre des Merveilles, but I really wanted to wear No 5 again. Make of that what you will. Yes, immediately noticed a Chanelly theme there. It’s kinda funny you mentioned this. I was thinking the other day that as the weather gets freezy and the ground gets frosty, I’ve been leaning more towards classic/aldehydic scents… Wonder why.